A new snack favorite! I was craving chocolate and had none on hand. I found half a bag of semi-sweet chocolate chips in the ‘frige, poured a mug of milk, and started to throw back some chocolate. The chips were pretty good, but I started to think deeper. Peanut Butter! But, I needed a crust, so graham crackers were just the thing. I had three squares of these things, and they were exactly what I needed. I’m sure these are not new to many people, but this is the first time I’ve enjoyed them. They need a name, not just, “These Things”. I will call them “giggleFritz Smores”. 1. Spread peanut butter over crackers. 2. 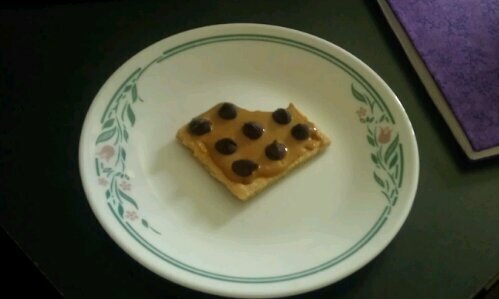 Sprinkle chocolate chips on top of peanut butter.